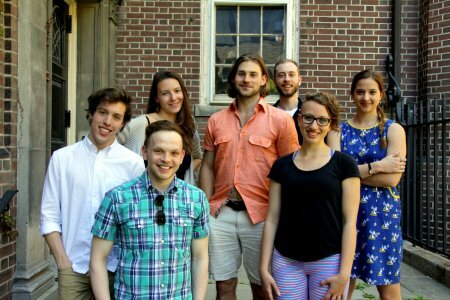 Group Therapy is the first production of new Toronto company Giggling Aristophanes Productions. This play, a ninety minutes long musical drama written and directed by company co-founder Marina Moreira, takes a seriously funny look at mental health through the persons of six therapy patients. Group Therapy is a great show promising great things to come for the company that produced it. The drama starts when six patients currently undergoing one-on-one therapy with a psychologist, unhappy with the progress of their individual therapy sessions, decide to try something new. Instead of relying on an expert for advice, they decide to set up their own mutual support network. Group Therapy follows the group members throughout their experiment, as they meet with each other in their regularly planned meetings and between these times. The achievements of Group Therapy couldn’t have been realized without a strong cast. I was particularly fond of the composed and secretive Charlotte (Elizabeth-Stuart Morris), nebbishy and repressed Graham (Stephen Lubin), and the buttoned-down Cody (Bryn Orth-Lashley), but each actor brought something to the show. Good use was made of lighting at the Passe Muraille, and the minimalist staging also served its purpose well. My only concerns were with the music, the various songs integrated into different scenes. At their best, some of the songs were smart and funny: the duet of Charlotte and Seamus (David Michael Moote) conducted over their encounter on an online dating site was a standout. Other times, the songs did not shine, becoming a bit too repetitive. These less successful songs did not hinder Group Therapy significantly, but they didn’t help, either. Group Therapy is a funny play with very good actors dealing in a memorable way with a serious issue. I’d strongly recommend this play for people who are interested in mental health issues, but I’d also recommend it for people who are interested in good drama produced by a promising new Toronto theatre company. I look forward to future Giggling Aristophanes Productions shows. Tickets for all mainstage productions are $10 at the door, cash only. Advance tickets are $12, and can be purchased online online, by phone (416-966-1062), or from the festival box office at the Fringe Club. (Rear of Honest Ed’s, 581 Bloor St. West). Money-saving value packs are also available if you are going to at least five shows; see website for details. Photo of Luisa Alvarez, Elizabeth Rose Morris, Callie Presniak, Elizabeth Stuart-Morriss, and Bryn Orth-Lashley by Trevor Koroll.